This semi-formal court surcoat (ji fu gua吉服褂) would have been worn by the wife of an imperial prince, a high-ranking clan member, or a Manchu official. Surcoats often featured flowers or birds. Here, roundels feature five cranes flying against a cloud-filled sky above mountains and waves (lishui 立水lit. standing water), motifs also seen on imperial dragon robes. The high proportion of the lishui waves, the numerous auspicious objects scattered amidst the waves, and the rocks rising up to fill the space around the bottom roundels suggest that this garment dates from the late nineteenth century. Indeed, this gown bears comparison to an informal robe (bian pao便袍) and short jacket (magua馬褂) in the Palace Museum collection once worn by an empress or concubine of the Guangxu Emperor (r.1875-1908). Both are blue satin and embroidered with clouds and cranes. 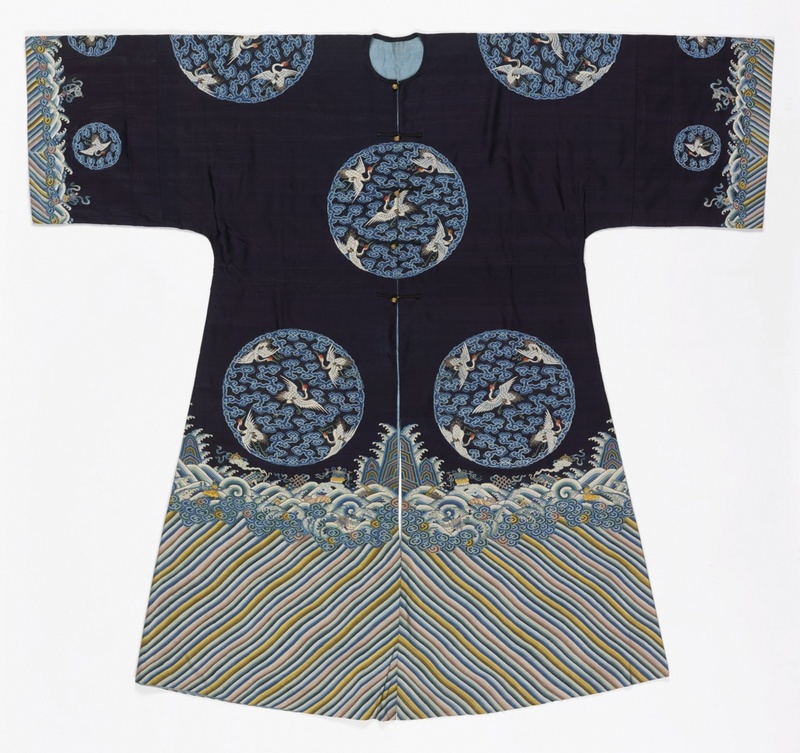 Flying cranes sometimes suggested that the wearer was rising in rank, though here, like the rank badge in the Cooper Hewitt collection (1902-1-433), it seems more likely that the crane is employed as a symbol of longevity, making the robe suitable for wear on a birthday or a celebration of long life. This coat is cut in a central fastening with three buttons and, as a surcoat, it features straight cut sleeves rather than the horseshoe cuffs of dragon robes, so it could be worn over another jacket, robe, or sleeveless long vest. ← Lions, and Tigers, No Bears, Oh My!